Camellia japonica is the most popular and the easiest to grow camellia variety in Texas. Blooming in late fall through early spring, in white through shades of pink and red, the camellia will provide color when few other plants are in bloom. Suitable varieties for Texas gardens include Debutante and Pearl Maxwell, according to Texas A&M University. In most areas of Texas, camellias thrive in areas with dappled sun or light shade. Dig a hole in the planting area that is twice the depth and three times as wide as the nursery pot in which the camellia is growing. Remove the soil from the area and replace it with a mixture of one-third sand and two-thirds peat moss. Native soils in many areas of Texas do not have the proper nutrients for the camellia to thrive. Pour the replacement soil over the planting area and level with the rake. Dig a hole 1 inch shallower than the camellia is currently growing and twice the width. Lay the pot on its side and slide the camellia out. If it is stuck, gently squeeze the sides of the pot with your hands to loosen any attached roots. Place the root ball into the planting hole and backfill the hole with soil. The top of the root ball should be slightly exposed above the soil. 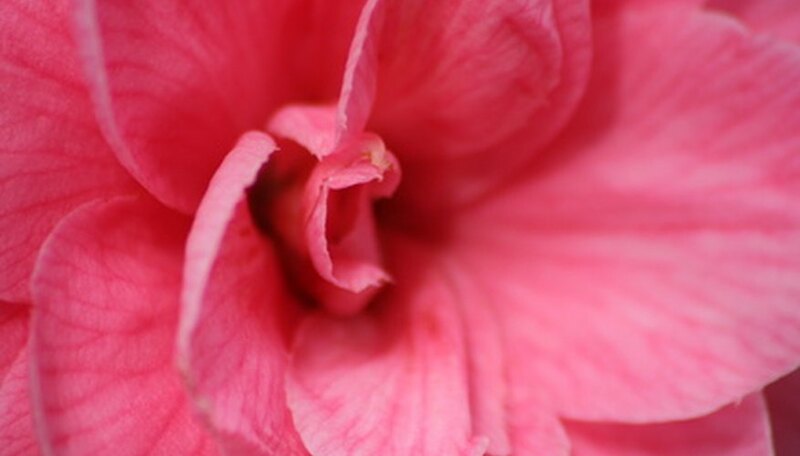 Place a 2-inch layer of mulch over the exposed roots and spread it in a 1-foot radius around the camellia. Water the soil to a depth of 15 inches. This amount of water should be sufficient for 10 to 15 days during periods with no rain, according Texas A&M University. Check the soil in 10 days if there is no rain and water if it is dry. Fertilize the Texas-grown camellia during the growing season, when the camellia is budding and blooming. This generally occurs between April and September. The Southern California Camellia Society warns that commercial fertilizers labeled for camellias are too harsh in the hot summers in Texas and using them may burn the plant. Apply cottonseed meal instead, at the rate suggested on the package, every six weeks, discontinuing in late July or early August. Always water the day before applying fertilizer and immediately after. Prune the camellia in spring before the plant produces buds. Remove inner branches that are blocking air-flow to the interior of the plant, and cut off weak or dead growth. Make all cuts back to a main branch.